Now Grandma Sally was not my Grandma but she was my friend Joy’s Grandma. Joy is a friend of mine and has been such a great supporter of Cooking with Candi. 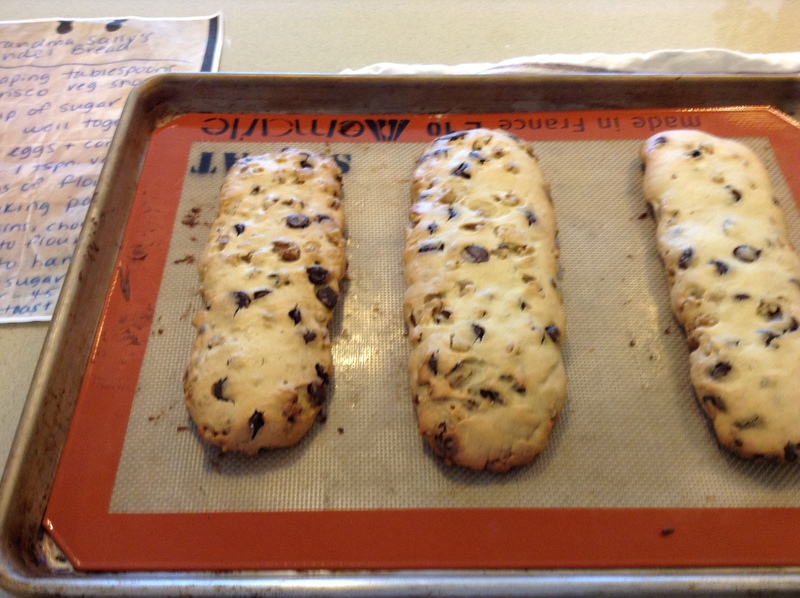 I know what a good cook she is and she sent me this recipe and was kind enough to share her family’s secret to an awesome mandel bread. She sent it to me a while back and I haven’t been able to test it out until now. I highly recommend this delicious treat for anytime but why not for the New Year? Thanks again Joy for all your support, it is so appreciated and of course to Grandma Sally for this delicious recipe. Perfect for Break Fast during Yom Kippur. 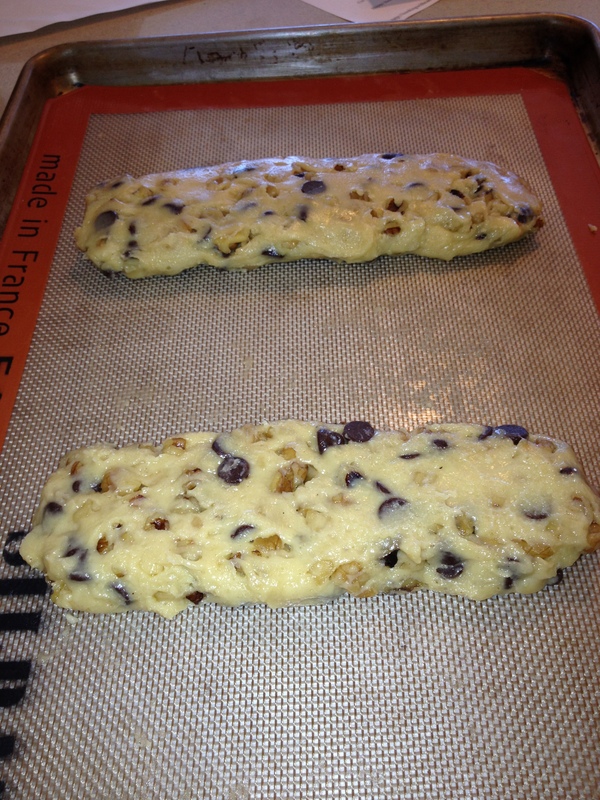 You can make 2 different mandel breads, one with nuts and one with chocolate or just mix them together . If you use them together use a little less nuts and a little less chocolate. 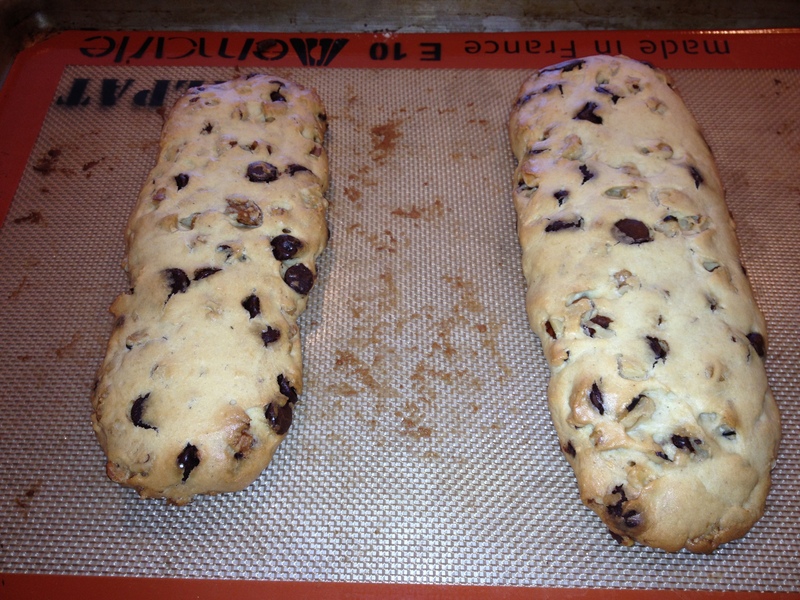 If you like you can add the raisins as well . Use whatever you prefer. I used both chocolate and nuts. 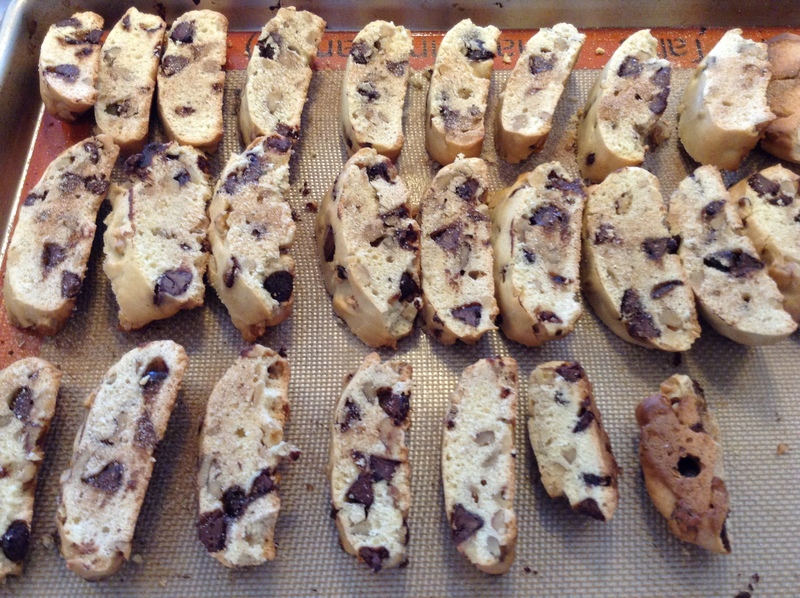 If you love biscotti this is almost identical. 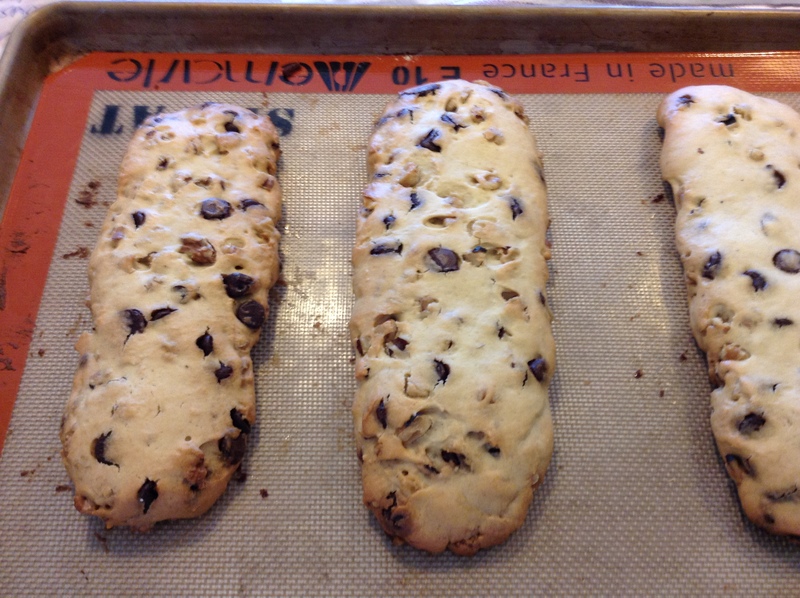 There are so very many ways to make Mandel Bread but this one was really worth the effort. Give it a try and let me know what you think. I think Joy gave me this recipe last year and I promised myself I would make it for this Rosh Hashana . I did make a few tweeks to the actual baking but the ingredients and most of the recipe stayed the same as Grandma Sally’s . I love to dunk these crunchy cookies in tea or coffee. Yum! P.S. woke up to these sitting in my kitchen and did a little dunking during breakfast with my morning coffee! They are hard to resist. 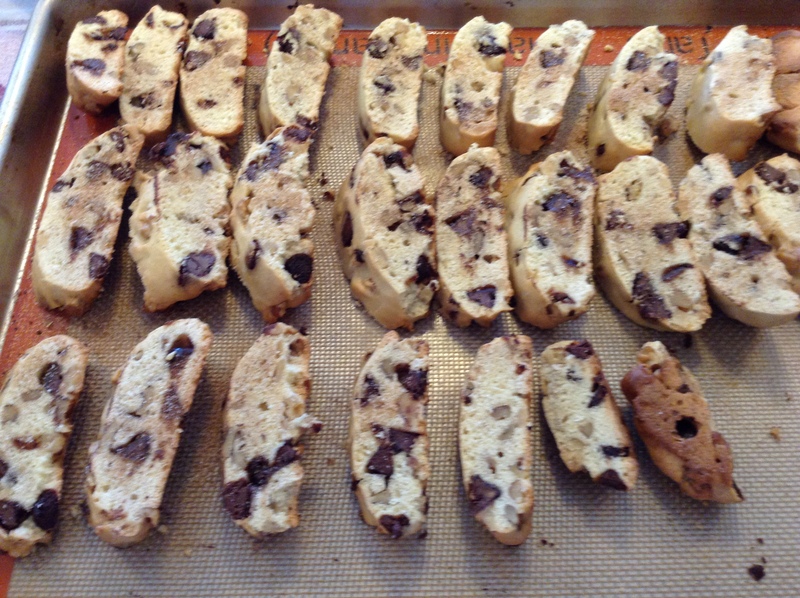 2/3 cup of chocolate bits , chocolate chips are fine here , if using alone without nuts you may want a little more . You can always use raisins as well. Whatever you like will work. Raisins and Nuts are great. 2 tablespoons granulated sugar and 3/4 teaspoon cinnamon, mix together for a cinnamon/sugar mixture. Set aside. Preheat the oven to 350 degrees. Line baking sheet with parchment paper or Silpat liners which I swear by ( awesome). Shape the dough into 2 or 3 logs about 2 inches wide ( see photos) making sure logs aren’t too close together because they will spread. So 2″ from edges from each other and 2″ from the edges. I used 2 baking sheets for 3 logs, you can just use 1 for 2 longer ones. If dough is super sticky , dust your hands with a little flour. Bake for 25-30 minutes at 350 degrees. Now lower the oven to 250 degrees. 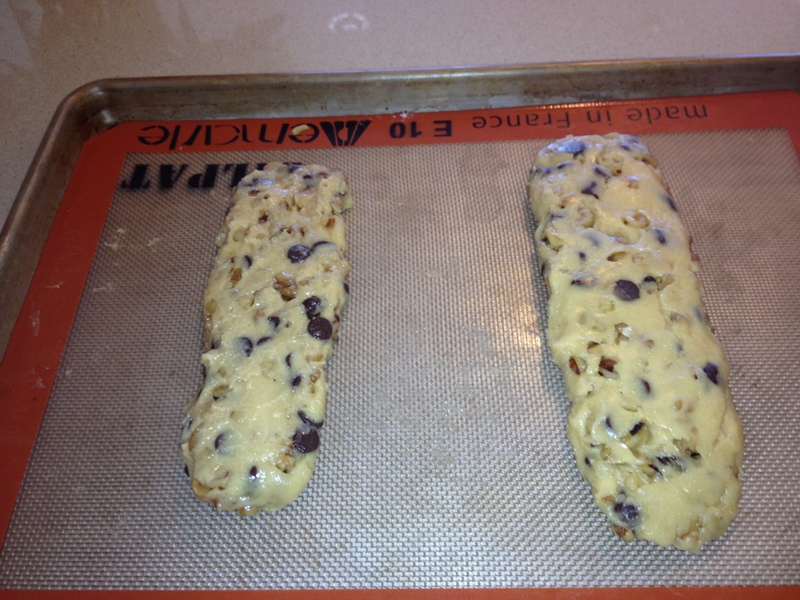 Let the baked logs cool down for about 15 minutes, then slice them diagonally about every 3/4 inch ( see picture) Flip the cookies on their sides back on baking sheet. Sprinkle 1/2 of the cinnamon-sugar mixture over top of cookies with a spoon. 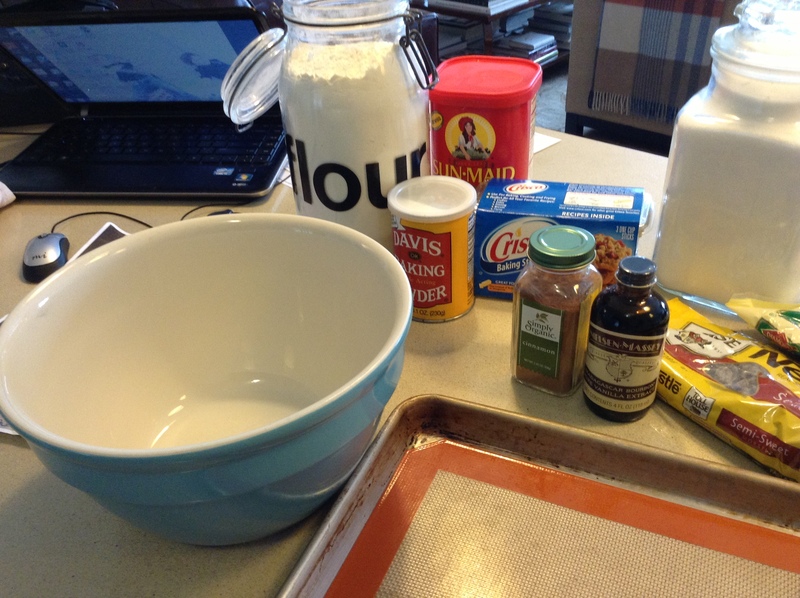 Flip the cookies over and repeat with the remaining cinnamon-sugar mixture. Place the cookies back in the oven ( be certain you turned temp. down to 250 degrees) I cooked for about 45 minutes ,you can cook anywhere from 45 minutes to an hour till they were golden and crisp. Let the cookies cool down, then store in an airtight container. This entry was posted in Baked Goods, cookies and tagged Biscotti like cookies, Grandma Sally's Mandel Bread, Mandel Bread. Bookmark the permalink. I am so happy that I finally got to make them. Thanks to you and G’ma Sally. 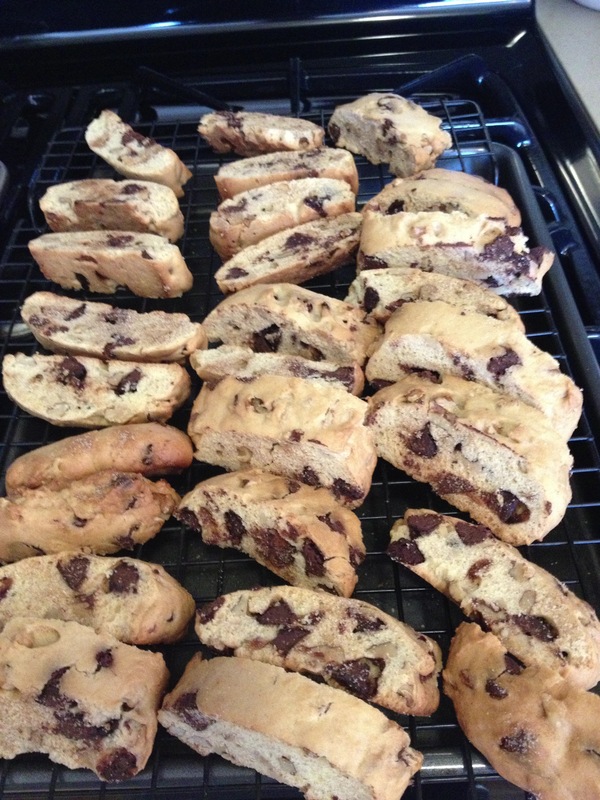 Beautiful and Delicious Mandel Bread for the Jewish Holidays!!! can be made ahead . Thanks again Joy for sharing. Happy Cooking and Happy New Year to all of you.